We met Maureen at an open house she was hosting and she was very helpful. She took us all over Montecito to look at properties. No pressure, nothing expected. I felt that Maureen was genuinely intent on our finding the right house and not overpaying and not simply hunting for a commission. Since we bought she has continued to be helpful. Took care of all the details and made great recommendations. A very happy experience. Bought a Single Family home in 2015 in Santa Barbara, CA. We were interested in the area around Montecito, CA and were exploring the possibilities with a couple of agents who, although nice, were ineffective. We happened upon Maureen McDermut at an open house she was holding and found her to be remarkably straightforward, sincere and extremely diligent. We discussed with Maureen our wants, needs, and limitations which rapidly led to a series of showings that were all appropriate for us, in that they were in our price range, of the correct square footage, in our desired neighborhood and school district. The negotiations were handled smoothly and professionally with a rapid positive outcome. Maureen is the ultimate professional she managed to make the process of buying a home stress free and actually enjoyable. We highly recommend Maureen to anyone buying or selling their home. the East Coast, and to our other family members who are out of town and could not be there day by day. I wholeheartedly recommend Maureen to anyone thinking of buying or selling a home in the Santa Barbara area. Maureen is hardworking, efficient and a very dedicated agent. We were looking for a very specific location and estate type in Montecito for a long time and Maureen has been wonderful in finding off-market listings. With tact and discretion, Maureen found us exactly what we were looking for. She has always been very responsive to our calls and emails, which we also greatly appreciated. Maureen fully deserves the trust we gave her. As a seller in a distressed market and probably the worst time of year for real estate I decided to put my house on the market. After interviewing many of the top real estate agents in Montecito and getting a lot of negativity I choose Maureen for her enthusiasm, her positive attitude, and her energy. Within a matter of weeks, in the worst market in real estate, Maureen brought me a qualified buyer and made selling my property as easy as she could for me. I can't recommend Maureen enough. She truly is a seller's dream. Without the patient guidance of Maureen McDermut, we would not now own the home of our dreams. Not only has Maureen demonstrated tremendous skill during one of the most difficult real estate markets in history, but she has also shown extreme patience in finding us not only a house, but our ideal situation. She listened to us and paid attention, providing sound advice along the way. After nearly two years of looking for the right opportunity, it would have slipped away save for Maureen's keen sense of the decisive action necessary to close the transaction. As a professional investor, the "art of the deal" is something that I am intimately familiar with. 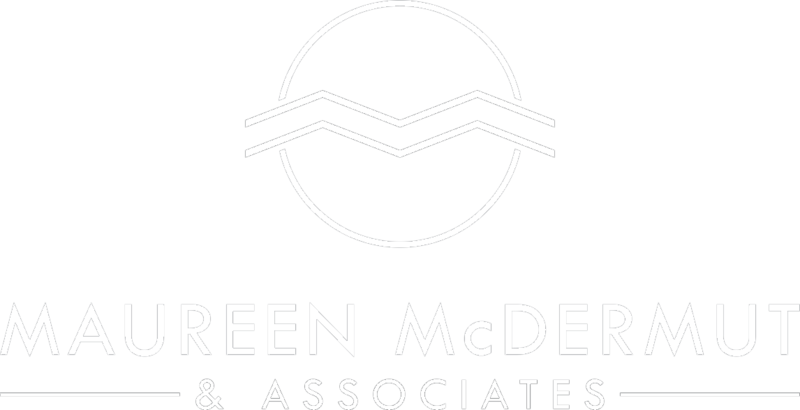 When it comes to finding, assessing and making the right "deal" in Santa Barbara real estate, there is no one we would trust above Maureen McDermut. We learned a lot from Maureen when we sold one house and bought another in Montecito in late 2008. She taught us that selling is about preparation, presentation, right-pricing for the real world, good marketing and closing with the right buyer. Buying is about careful comps, the right property, good cultivated relationships with the sellers' agents, and smart offers and counters. Maureen listened to what we wanted, suggested what we needed, and led us through the campaigns. Optimistic but no Pollyanna, tough in the trenches, organized, hard-working, and helpful in all sorts of unexpected ways, Maureen was an ally in the challenge and became a friend to our family. We just recently completed the purchase of an amazing home in Montecito, CA. Maureen was instrumental in the process of winning the bidding for this popular home. She was very thorough in her analysis of the property and extremely persistent with the sellers agent and the trustee who was overseeing the sale. We are extremely satisfied with Maureen and would recommend her highly to other buyers looking for the right home and the right price!